Intellectual property (IP) refers to creations of the mind. It encompasses several types of rights, such as copyright, trademarks, patents and designs. Just like any other property right, intellectual property rights allow their owners to benefit and get income from creations such as paintings, sculptures, fashion items, logos, games, software, photos, and many more. Despite its relevance for artists and designers, IP is not yet part of the educational curriculum of art academies. This workshop addresses this gap, since it is important to know your IP rights as soon as your career starts to develop, whether you are a student or a professional. What type of IP rights are there and what do they protect? How do you protect your creations before entering the market and to make sure they are not copied? How do you generate income from marketing the creation through, for instance, licensing? How do you register a trademark of a design? What type of trademark should you have? The rules of thumb when creating a trademark. What are your rights when receiving a commission, or selling an artwork or a product? What to do when your rights are infringed? Through a mixture of a presentation, Q&A and interactive workshop with Ana Ramalho, the founder and Director of the Indie Art Legal Clinic. You will also learn by sharing your experiences and knowledge of the market with the other participants. Your are encouraged to bring an object or work you have created and you would like to know more regarding IP protection and exploitation. 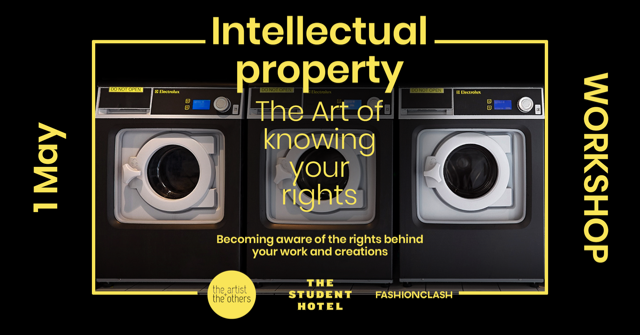 If you are a creative professional or recent graduate who wants to gain more information about your professional rights and how to acquire and protect these rights, this workshop is a must for you. Artists & designers who want to know their rights when it comes to receiving a commission or selling an artwork or product and who want to be aware of how to register a trademark. In conclusion, this masterclass is for any creative who is professionally interested in knowing their intellectual property rights. The workshop has been created in order to give you the basic knowledge that professional must have on intellectual property for artists and designers to develop their professional career further. Please keep in mind spaces are limited for this workshop! You can bring an object or work you have created, about which you would like to know more regarding IP protection and exploitation. Join us, get your spot and master IP for your future career! Ana Ramalho is an Assistant Professor of Intellectual Property Law at Maastricht University, and the Director of the Indie Art Legal Clinic. She holds a PhD in Copyright and European Law from the University of Amsterdam (2014), a Research Master in Intellectual Property Law from the University of Lisbon (2008), an LL.M. in Intellectual Property and Competition Law from the Munich Intellectual Property Law Center (2007) and a 5-year advanced LL.B. from the University of Lisbon (1999). She is the recipient of numerous competitive intellectual property grants and fellowships. She has 50 publications in the intellectual property field, and has been a guest lecturer and/or speaker at numerous foreign Universities, such as the University of Melbourne (Australia), the Queensland University of Technology (Australia), the University of Western Australia (Perth, Australia), Nagoya University (Japan), the China University of Political Science and Law (China), the Iustinianus Primus Law Faculty (FYROM), Oxford University (UK), the University of Warwick (UK), the University of Lisbon (Portugal), the Federal University of Santa Catarina (Brazil), the University of Turin (Italy), etc. The Indie Art Legal Clinic provides pro-bono advice to independent artists (visual artists, musicians, performers, street artists, film makers, game designers, programmers, etc.). The advice is given by mixed teams of both master and bachelor students, upon request from an artist. Students work together by identifying the problem, researching possible solutions and issuing a report with the proposed solution, all under supervision of a faculty member and an experienced lawyer. The client can meet with the team after this report is issued, for a face-to-face consultation (which is made under the supervision of either the faculty member and/or a lawyer as well).